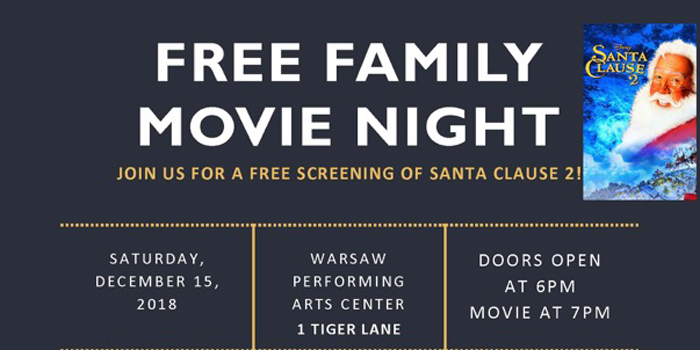 WARSAW — The Warsaw Performing Arts Center is excited to welcome families to a free screening of Disney’s “Santa Clause 2” on Saturday, Dec. 15. Doors open at 6 p.m. and attendees are welcome to purchase refreshments or take their picture with Santa and his elves. The showing of the movie will begin at 7 p.m. The Warsaw PAC is located at 1 Tiger Lane, Warsaw. This event is made possible through the support of ACTS.